MINNEAPOLIS — July 26, 2016 — Indian Motorcycle®, America’s first motorcycle company, today announced its lineup of Model Year 2017 bikes. The 2017 family carries forth all 2016 models including the recently released Scout® Sixty, Indian Springfield™, and Chieftain Dark Horse® models, while featuring an array of new features, new color choices, awe-inspiring infotainment, and much more. Indian® Scout® – Riding a landslide of awards, accolades and phenomenal sales success, the ever-classic Indian Scout is back for 2017. This middle-weight cruiser’s weight has been reduced to 538 pounds (dry) and extends its legacy of dominance with perfect balance, precise handling and category-leading power and quickness. With a low 25.3-inch seat height and available extended and reduced reach accessories, the Indian Scout is the perfect bike for riders of many sizes and skill levels. Featuring a liquid-cooled 69 cubic inch V-twin engine, an exhilarating 100 HP of raw power, and starting at $11,299, the 2017 Indian Scout is the thoroughly modern rebirth of an American classic. Available in Ivory Cream, Thunder Black, Silver Smoke and Thunder Black Smoke. Indian Scout featuring ABS is offered in Burgundy Metallic plus a pair of two-tone finishes starting at $12,299. Chief Dark Horse® – Embrace the darkness with the 2017 Indian Chief Dark Horse, the baddest, boldest bike on the road. With the endless power of the award-winning Thunder Stroke 111 engine, end-to-end matte black finish and just a touch of chrome, every other bike on the road seems tame. Featuring ABS, remote key fob for keyless ignition, electronic cruise control, a dry weight of 751 pounds and starting at just $17,499, the Indian Chief Dark Horse® has it all – including a seriously bad attitude. Chief® Vintage – The 2017 Chief Vintage is the ultimate retro-vintage bagger, turning heads with its classic styling, iconic soft-sided saddle bags crafted from Desert Tan Genuine Leather – dripping in fringe and Indian Motorcycle nostalgia. Featuring the classic power of the Thunder Stroke 111 engine, the Chief Vintage is offered in Thunder Black and three gorgeous two-tone vintage color schemes. MSRP starting at $19,999. Chieftain® & Chieftain Dark Horse® – Indian Motorcycle proudly offers riders an opportunity to “Lead the Pack” with two of America’s most commanding, versatile and awe-inspiring bikes. Both feature the Thunder Stroke® 111 engine, TPMS, ABS, fairing with integrated driving lights and power windshield, cruise control, remote locking hard bags, keyless ignition, and much more. 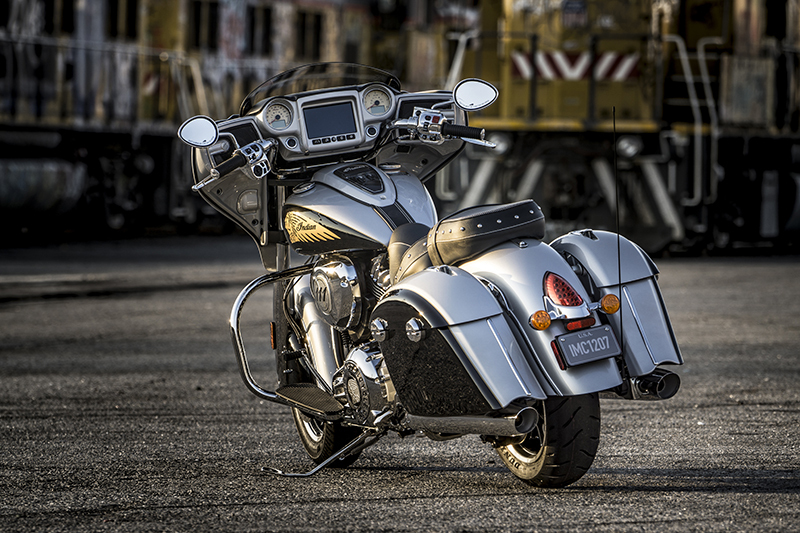 The Chieftain Dark Horse, starting at $21,999, is the newest addition to Indian’s bagger family. Sporting a premium 100W audio system and an ominous nose-to-tail matte black finish with minimal chrome for a menacing presence that refuses to be ignored. The Indian Chieftain starts at $23,999 and comes standard with the all-new Ride Command™ system, blasting out 100W of premium audio and all the infotainment features a rider leading the pack could ever want. The Chieftain is available in Thunder Black Pearl, White Smoke, Silver Smoke, and a pair of two-tone palettes. Indian Springfield™ – Named after the birthplace of Indian Motorcycle, the Indian Springfield offers classic styling blended with thoroughly modern technology for a purist’s take on both touring comfort and urban versatility. The Springfield can be quickly converted into a cruiser with the quick-release windshield and saddlebags removed, or transformed into a high-capacity touring model with Genuine Indian Motorcycle accessories. Remote locking hard bags and adjustable passenger floorboards come standard along with genuine leather seating, ABS, TPMS, cruise control, and a powerful headlight and dual driving lights. Indian Springfield is offered in Thunder Black or Indian Motorcycle Red. New for 2017 are stunning Steel Gray/Burgundy Metallic and Blue Sapphire/Star Silver two-tone finishes. Starting at $20,999. Indian® Roadmaster® – The Roadmaster returns for 2017 as the industry’s flagship tourer and the epitome of luxury and comfort. Powered by the rock solid Thunder Stroke 111 engine and offering nearly 38 gallons of storage, Roadmaster is “Your Ultimate Ride.” It offers a wealth of ergonomic luxury and innovations for rider and passenger alike, including a power-adjustable windscreen, heated grips, individually controlled heated seats for driver and passenger, ABS, TPMS, keyless ignition with remote locking storage, electronic cruise control and adjustable passenger floorboards. New for 2017, Roadmaster comes standard with the Ride Command™ infotainment system, delivering a glorious 200W premium audio experience, along with state-of-the-art GPS/Navigation, a 7-inch high-resolution touchscreen display, seamless Bluetooth® integration, hands-free calling, a wealth of vehicle information, and more. Offered in Thunder Black, Burgundy Metallic, and three two-tone palettes starting at $28,999. Sturgis attendees are cordially invited to view the entire new 2017 lineup at the Indian Motorcycle Factory display on Lazelle St. throughout the rally, or to experience them firsthand with a Factory Demo Ride at 2100 Whitewood Service Road (I-90 at Exit 30) from August 6 – August 12 from 9 a.m. – 5 p.m. daily. The entire family of 2017 models will be available for demo rides, including a selection of accessorized models. Learn more about Indian Motorcycles’ 2017 lineup at IndianMotorcycles.com. I would take a Victory Vision over a Roadmaster or Chieftain if only Polaris (the parent company of both Indian and Victory) would give the former some decently sized saddlebags and update the switchgear and stereo. …Given that HD’s new touring rigs may have gone the way of the stupid with screw and locknut adjusted valves, Indian (and Victory) make far more sense than Harleys. If HD kept the hydraulic lifters, then they are in the running for my money. Tell us more about Harley’s valve changes. Harley is supposed to have a new engine coming out with 4 valves per cyl operated by 1 cam and followers for the valves which have screw and lock nut adjusters..not hydraulic. Motor still looks more or less like classic Harley V twin but it’s supposed to sound different ( not sure how that would go over), but supposedly it puts out good HP ( over 100 and I’ve read a s much as 135 but doubt that figure) and believe it will come out in the touring bikes first then the others a year or two later. Heads may have the targeted liquid cooling. If they are going with a solid tappet system, they may well be shooting for a high hp number (and therefore higher rpm where the reliability of hydraulics become a little more questionable.) I’ll be interested to see how this develops. Re: the “infotainment” thing-Just got back from an end-of-day sunset ride on my 2007 Bonneville. Along the way I once again took notice of the nice view of the instruments/clean handlebar area. Have to look down a bit to see it. Beautiful unobstructed view of the road, feels great. I know we all have our preferences in all things, and the Indian is a piece I’m sure instills great pleasure at all levels for owners, but Holy Crap I can’t imagine having all that stuff on my handlebars. Not to mention the distraction potential. I will admit I don’t even have a cell phone, flip or otherwise. +1. I have a cellphone (flip) so I guess I’m a bit more ‘modern,’ but pinch to zoom?!?! Why not just duct tape an iPad to your handlebars?